Two new areas in the North of Sardinia with Blue Flags for 2018. La Marinedda and the Spiaggia Lunga at Isola Rossa are now part of the list of Italian dream beaches. 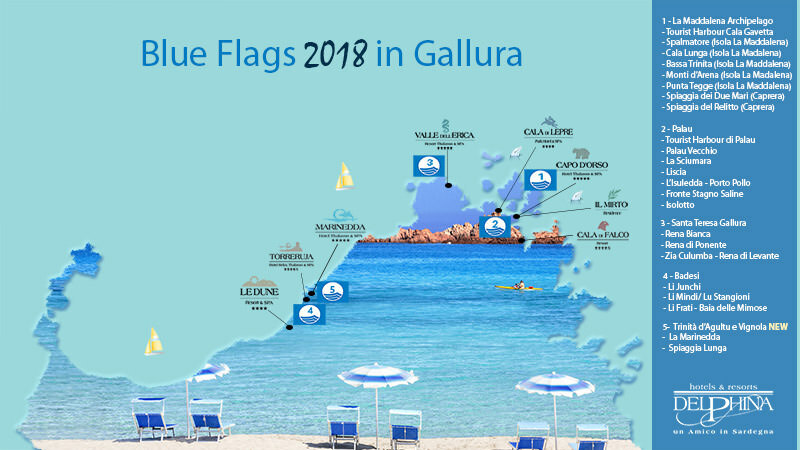 The number of Blue Flags flying along the whole Gallura coastline from Badesi to the Costa Smeralda has risen in 2018 to cover five different areas. 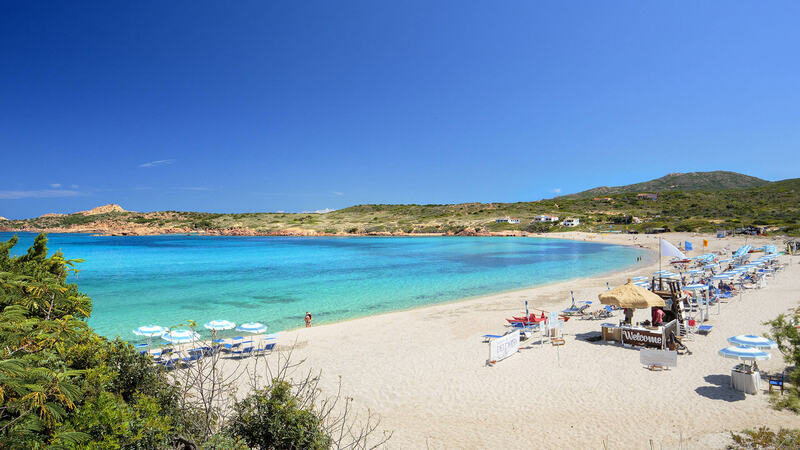 These include the La Maddalena Archipelago, Palau, Santa Teresa Gallura, Badesi and from this year Trinità d’Agultu and Vignola which have 21 dream beaches, all just a stone’s throw from Delphina hotels and resorts. The beach at La Marinedda is a fabulous crescent of white sand surrounded by verdant Mediterranean vegetation already defined by Bell’Italia as one of the “sand and water paradises of Sardinia where it is worth swimming at least once in your life”. The Hotel Marinedda Thalasso & SPA, the only 5-star hotel on the Costa Rossa and an oasis of relaxation right in front of the beach, is the ideal place to enjoy the sea and rediscover a sense of wellness at the Elicriso Thalasso & SPA centre, one of the largest in the Mediterranean. The bay, famous as a destination for surfers and those who enjoy other water sports also offers a wonderful underwater world with an astonishingly beautiful seabed that regularly attracts diving enthusiasts. Just 10 minutes walk from the Hotel Marinedda will bring you to the typical village of Isola Rossa with its Spiaggia Lunga, another marvelous Costa Rossa beach that has recieved FEE recognition. This slender strip of sand equipped with sun loungers, umbrellas and water games is the beach most used by guests at the Hotel Torreruja Thalasso & SPA, the Delphina hotel dedicated to couples looking for privacy and relaxation. With the recognition obtained by the beach at La Marinedda and the Spiaggia Lunga at Isola Rossa, the Costa Rossa becomes even more important as one of the resorts with the most beautiful seas in Italy and the prestige of the 2017 Blue Flags is maintained, keeping the North of Sardinia in pole position as the home of the island’s largest number of award-winning beaches. And now there are dream beaches for every Delphina hotel and resort! The Badesi Blue Flag flies high over the beach at Li Junchi, the beach facing the Resort Le Dune as well as the nearby beaches of Li Mindi and Baja delle Mimose. The Blue Flag beaches at Palau are just a few minutes from the Hotel Cala di Lepre and the Hotel Capo d’Orso while the Santa Teresa Gallura coasts awarded Blue Flag status by the FEE are easily reachable from the Valle dell’Erica Thalasso & SPA Resort. Thanks to Delphina’s excursions it is also possible to dive into the little bays of the La Maddalena Archipelago which has a good seven Blue Flag beaches. Here is the map of the places in the North of Sardinia that have been awarded this recognition and the hotels closest to the 2018 Blue Flags.